"Every belly dancer should own a copy." In the past, belly dancing is thought to have been used solely as a means of entertaining. Although commonly known as belly dancing in the United States, the dance is traditionally called raqs sharqi. Translated, raqs sharqi means oriental dancing. There is also a second traditional dance style that is sometimes referred to as belly dancing which is called raqs baladi. However, of the two dance types, the latter is more common in the Middle East than it is in the United States. Both dances are performed by men and women. That being said, female performers are more prevalent. The reason why it is referred to as belly dancing is because the dance focuses on controlling the core abdominal muscles to create undulating movements. Additionally, the scant costumes used also have something to do with the nickname as they usually bare the belly. Originally, the dance costumes were less revealing, and although sheer fabric was used, the dancer was usually covered from chest to ankles. Now, costumes consist of a bra and either a skirt or harem pants. Usually, the fabric is decorated with embroidery, beads or coins to enhance the dancer's movements. There are ten common styles of belly dance being practiced today. These include tribal belly dance, classic American belly dance, gypsy belly dance, sfusion belly dance, piritual belly dance, fitness belly dance, Egyptian belly dance, Turkish belly dance, Lebanese belly dance, and East Indian belly dance. While each style differs from the next, each one is based on a set of four core movements, which are staccato hip moves, rolling hip moves, ribcage circles and arm, shoulder and head movements. In Western belly dance styles, these core movements are also used; however, they are usually combined with a dancer's unique set of movements to create a modern dance approach that pulls from each one of the traditional styles. Although there is some speculation about the origins of belly dancing, it widely accepted that it originated from the Middle East. However, this is where the facts stop and speculation begins – there is no concrete explanation of why belly dancing originated. Some say that it was a practice in harems to keep the interest of the sultan. Others feel that it was a way to show and teach sexual prowess. Still, other historians and enthusiasts are certain that the dance was originally used to demonstrate giving birth. In addition to being a Middle Eastern and Oriental tradition, scholars have also found the dance depicted as early as 5,000 BC in Greek paintings. Today, belly dancing is practiced by a diverse array of dancers who wish to not only gain better health through fitness, but also those who want to improve their self esteem. Although it is still a form of entertainment, it is also used as a tool to strengthen and tone core muscle groups in the body, like the lower back muscles. The modern application of belly dancing that is often practiced in the United States is accessible to a greater degree of people because the movements are far easier on the joints than traditional belly dancing. However, it doesn't focus on a single style of belly dance. Instead, the Americanized version of the dance usually combines several different styles into a single one which is referred to as the American Tribal Style. Although belly dancing may look like it's very easy to perform, the core movements are actually relatively difficult to perfect. The technique relies on the dancer's ability to perfectly control each of the core muscle groups, which can take considerable time and practice to master. This reliance on core stability is the main reason why belly dancing is regarded as a wonderful, low impact way to improve muscle tone. When having a difficult time deciding on the right style of belly dance, it helps to focus on just learning the twelve core movements because doing so will make it easier to transition from one style to the next. Belly dance is a Western-coined name for a traditional Middle Eastern dance, especially raqs sharqi. It is sometimes also called Middle Eastern dance or Arabic dance in the West, or by the Greco-Turkish term çiftetelli (Greek: ). Raqs Sharqi dancer Chryssanthi Sahar Scharf, Heidelberg. The term "Belly dance" is a misnomer as every part of the body is involved in the dance; the most featured body part in raqs sharqi being the hips. Belly dance takes many different forms depending on country and region, both in costume and dance style; and new styles have been invented in the West as its popularity has spread globally. •	Raqs sharqi (Arabic: literally "oriental dance") is the style more familiar to Westerners, performed in restaurants and cabarets around the world. It is more commonly performed by female dancers but is also sometimes danced by men. It is a solo improvisational dance, although students often perform choreographed dances in a group. •	Raqs baladi, (Arabic: ; literally "dance of country", or "folk" dance) is the folkloric style, danced socially by men and women of all ages in some Middle Eastern countries, usually at festive occasions such as weddings. As with any dance of folkloric origin, the roots of belly dance are uncertain. The authenticity of even "traditional" or "classical" forms of belly dance is open to question and often hotly disputed. 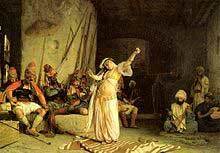 One theory is that belly dance was originally danced by women for women in the Levant, and North Africa. This theory is very popular in Western dance schools because it helps counteract negative sexual stereotyping, but there is no written evidence to support it. The book "Dancer of Shamahka" is widely cited, but it is in fact, a romanticized memoir written by a modern author, Armen Ohanian, published in 1918. In Middle Eastern society two specific belly dance movements have been used in childbirth for generations, but this is not sufficient evidence to prove that belly dancing arose from birthing rituals – the birthing rituals could equally have arisen from belly dancing. Another theory is that belly dance may have roots in the ancient Arab tribal religions as a dance to the goddess of fertility. A third theory is that belly dance was always danced as entertainment. Some belly dance historians believe that the movements of dancing girls depicted in carvings in Pharaonic times are typical of belly dancing. While these theories may have some foundation, none of them can be proved to be the origin of belly dance. It is more likely that all these factors contributed to the development of belly dance as we know it today. The first recorded Western encounter with belly dance is during Napoleon's invasion of Egypt in 1798, when his troops encountered the gypsy dancers of the Ghawazee, and the more refined dancing of the Almeh. Belly dance was later popularized during the Romantic movement of the 18th and 19th centuries, when Orientalist artists depicted romanticized images of harem life in the Ottoman Empire. Around this time, dancers from Middle Eastern countries began to perform at various World Fairs, often drawing crowds in numbers that rivaled those for the science and technology exhibits. Several dancers, including the French author Colette, engaged in "oriental" dancing, sometimes passing off their own interpretations as authentic. There was also the pseudo-Javanese dancer Mata Hari, convicted in 1917 by the French for being a German spy. In the West, the costume most associated with belly dance is the bedlah (Arabic for "suit"). It owes its creation to the Victorian painters of "Orientalism" and the harem fantasy productions of vaudeville, burlesque, and Hollywood during the turn of the last century, rather than to authentic Middle Eastern dress. The hip belt is a broad piece of fabric worn low on the hips. It may have straight edge, or may be curved or angled. The bra usually matches the belt and does not resemble lingerie. The classic harem pants are full and gathered at the ankle, but there are many variations. Sometimes pants and a sheer skirt are worn together. Skirts may be flowing creations made of multiple layers of sheer fabric such as chiffon, or figure-hugging lycra. Since the 1950s, it has been illegal in Egypt for belly dancers to perform publicly with their midriff uncovered or to display excessive skin. It is therefore becoming more common to wear a long, figure-hugging lycra one-piece gown with strategically placed cut-outs filled in with sheer, flesh-coloured fabric. If a separate bra and skirt are worn, a belt is rarely used and any embellishment is embroidered directly on the tight, sleek lycra skirt. A sheer body stocking must be worn to cover the midsection. Egyptian dancers traditionally dance in bare feet, but these days often wear shoes and even high heels. As there is no prohibition on showing the stomach in Lebanon, the bedleh style is more common. The skirts tend to be sheer and/or skimpier than Egyptian outfits, showing more of the dancer's body. The veil is more widely used and the veil matches the outfit. High heels are commonly worn. Turkish dancers also wear bedleh style costumes. In the 80s and 90s the art became debased in Turkey and a 'stripperesque' costume style developed, with skirts designed to display both legs up to the hip, and plunging bras. Such styles still exist in some venues but there are also many serious, respectable Turkish belly dancers who wear more moderate costumes. Even so, all Turkish belly dance costumes reflect the playful, flirty style of Turkish belly dance. American dancers often purchase their costumes from Egypt or Turkey, but hallmarks of the classical "American" style include a headband with fringe, sheer harem pants or skirt rather than tight lycra, and the use of coins and metalwork to decorate the bra. •	Finger cymbals (zills or sagats). Most of the movements in belly dancing involve isolating different parts of the body (hips, shoulders, chest, stomach etc. ), which appear similar to the isolations used in jazz ballet, but are often driven differently. In most belly dance styles, the focus is on the hip and pelvic area. •	Shimmy – a shimmering vibration of the hips. This vibration is created by moving the knees past each other at high speed, although some dancers use contractions of the glutes instead. Dancers also put one leg to the side and then shimmy is performed by vibration of the leg which bears the weight. Shoulder shimmy is also an important element of belly dance. •	Swinging arms – important expressive means in belly dance and highlights the beauty and flexibility of the dancer. In many cases hands are used to frame around the moving part of the body to stress the expressiveness of that part. •	Hip punches – basic move. Helps alternate the weight on the legs and create impression of the swinging pelvis. •	Undulation – rotating movements of the chest forward, up, back and down create impression of riding a camel. In Egypt, three main forms of the traditional dance are associated with belly dance: Baladi/Beledi, Sha'abi and Sharqi. Baladi is a folk style of dance from the Arab tribes who settled in Upper Egypt. Sharqi is based on the baladi style but was further developed by Samia Gamal, Tahiya Karioka, Naima Akef, and other dancers who rose to fame during the golden years of the Egyptian film industry. Later dancers who based their styles partially on the dances of these artists are Sohair Zaki, Fifi Abdou, and Nagwa Fouad. All rose to fame between 1960 and 1980, and are still popular today. Though the basic movements of Raqs Sharqi are unchanged, the dance form continues to evolve. Nelly Mazloum and Mahmoud Reda are noted for incorporating elements of ballet into bellydance, and their influence can be seen in modern Egyptian dancers who stand on relevé as they turn or travel in a circle or figure eight. Although Western dancers view Egypt as the Holy Grail of belly dance, belly dancers in Egypt are not well regarded. Egyptians do not consider it a respectable profession, and most belly dancers performing for tourists in Egypt today are foreigners. Dancers are not allowed to perform certain movements or do any floor work. State television in Egypt no longer broadcasts belly dancing. A plan to establish a state institute to train belly dancers in Egypt came under heavy fire as it "seriously challenges the Egyptian society's traditions and glaringly violates the constitution," said Farid Esmail, a member of parliament. Some mistakenly believe that Turkish oriental dancing is called Çiftetelli because this style of music has been incorporated into oriental dancing by Arabs and Greeks. In fact, Greek and Cypriot belly dance is called Tsifteteli. However, Turkish Çiftetelli is actually a form of lively wedding music and is not connected with oriental dancing. Turkish, Greek, and Cypriot belly dance today may have been influenced by Arabs before the Ottoman Empire as much as by the Egyptian and Syrian/Lebanese forms. Turkish law does not impose restrictions on dancers as they do in Egypt, where dancers must keep their midriffs covered and cannot perform floor work and certain pelvic movements. This has resulted in a marked difference in style - Egyptian bellydance is noted for its restraint and elegance, whereas Turkish bellydance is playful and uninhibited. Turkish belly dance costumes have been very revealing, although there is a move towards more modest, Egyptian-style costuming. Many professional dancers and musicians in Turkey continue to be of Romani heritage and also from Kurdistan as Kurdish people too were mixed with the Ottoman Empire, which is the great part of a varied fusion in this dance. (There is also a distinct Turkish Romani dance style which is different from Turkish Oriental.) Turkish dancers are known for their energetic, athletic (even gymnastic) style, and their adept use of finger cymbals, also known as zils. Connoisseurs of Turkish dance often say a dancer who cannot play the zills is not an accomplished dancer. The term "belly dancing" is generally credited to Sol Bloom, entertainment director of the 1893 World's Fair, the World Columbian Exposition in Chicago, although he consistently referred to the dance as "danse du ventre," of which "belly dance" is a literal translation. In his memoirs, Bloom states only that "when the public learned...danse du ventre...I had a gold mine." Although there were dancers of this type at the 1876 Centennial in Philadelphia, it was not until the Chicago World's Fair that it gained national attention. There were authentic dancers from several Middle Eastern and North African countries, including Syria, Turkey and Algeria, but it was the dancers in the Egyptian Theater of The Street in the Cairo exhibit who gained the most notoriety. The fact that the dancers were uncorseted and gyrated their hips was shocking to Victorian sensibilities. There were no soloists, but it is claimed that a dancer nicknamed Little Egypt stole the show. Some claim that the dancer was Farida Mazar Spyropoulos, but this fact is disputed. The popularity of these dancers subsequently spawned dozens of imitators, many of whom claimed to be from the original troupe. Victorian society continued to be affronted by this "shocking" dance, and dancers were sometimes arrested and fined. The dance was nicknamed the "Hootchy-Kootchy" or "Hoochee-Coochie", or the shimmy and shake. A short film, "Fatima's Dance", was widely distributed in the nickelodeon (movie theater)s. It drew criticism for its "immodest" dancing, and was eventually censored. Belly dance drew men in droves to burlesque theaters, and to carnival and circus lots. Thomas Edison made several films of dancers in the 1890s. These included a Turkish dance, and Crissie Sheridan in 1897, and Princess Rajah from 1904, which features a dancer playing zills , doing "floor work", and balancing a chair in her teeth. Ruth St. Denis also used Middle Eastern-inspired dance in D.W. Griffith's silent film Intolerance, her goal being to lift dance to a respectable art form at a time when dancers were considered to be women of loose morals. Hollywood began producing films such as The Sheik, Cleopatra, and Salomé, to capitalize on Western fantasies of the orient. When immigrants from Arab States began to arrive in New York in the 1930s, dancers started to perform in nightclubs and restaurants. Some of today's most accomplished performers are their descendants, e.g. Anahid Sofian, Aisha Ali, and Artemis Mourat. In the late 1960s and early '70s many dancers began teaching. Middle Eastern or Eastern bands took dancers with them on tour, which helped spark interest in the dance. Although using traditional Turkish and Egyptian movements, American Cabaret or American Restaurant belly dancing has developed its own distinctive style, using props and encouraging audience interaction. Many modern practitioners make use of the music of Egyptian Sha'abi singers, including Ahmed Adaweya, Hakim, and Saad el Soghayar in their routines, which combines the percussion of modern Egyptian music with a traditional feeling for music and dance in the Raks Sha'abi (dance of the people) style. Many forms of "Tribal Fusion" belly dance have also developed, incorporating elements from many other dance and music styles including flamenco, ballet, burlesque and even hip hop. "Gothic Belly Dance" is a style which incorporates elements from Goth subculture. Tribal style dance is characterized by muscle isolation to create smooth, undulating movements. Popular conceptions of bellydance as a seductive art have allured observers but prevented the dance form from being recognized as a legitimate art form. Tribal Differs from ballet, jazz and modern in its extreme emphasis of core muscle isolation (especially in the abdomen, pelvic girdle, and thoracic spine) and lack of hard impact moves. Because of the greater emphasis on muscular isolation than skeletal virtuosity, Tribal dance is accessible to people with a wider range of body types, ages, and health problems than many classic theater dance arts. In 1987, a uniquely American style, American Tribal Style Belly Dance, (ATS), was created. Although a wholly modern style, its steps are based on a fusion of ancient dance techniques from North India, the Middle East, and Africa. Another belly dance fusions introduced in America include Belly Hooping: the integration of Hula Hoop with traditional belly dance. This new belly dance fusion is currently lead by the Unity troupe which is organized by Valentina, the daughter of Leela Martin from Leela with Salomé Jihad. The dance team is also known for introducing fire hoops in their choreography. 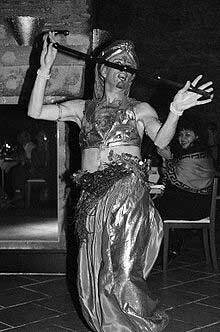 The first wave of interest for belly dancing in Australia was during the late 1970s to 1980s with the influx of migrants and refugees escaping troubles in the Middle East, including drummer Jamal Zraika. These immigrants created a lively social scene including numerous Lebanese and Turkish restaurants, generating interest in the dance and providing employment for belly dancers. Early dance pioneers included Amera Eid and Terezka Drnzik. Both of these teachers have pedigrees linked back to Rozeta Ahalyea. Belly dance has now spread across the country, with vibrant belly dance communities in every capital city and many regional centres. Canada has a belly dance community similar to United States. Belly dance culture has been evidenced in the UK and Ireland since the early 1960s. Many festivals are held, with two of the most popular being the Annual Glastonbury Majma and Raqs Britannia. Male belly dancer in Istanbul Turkey. There is much debate over the place of men in the belly dance world. Turkish miniatures from the Ottoman Empire show performances by young men called köçeks. The Sultan employed a köçek troupe in addition to a female troupe. (Metin And: A pictorial history of Turkish Dance). The youths wore heavy makeup, gold-embroidered velvet jackets and silk shirts, harem pants, long skirts, and belts. They were said to be "sensuous, attractive, effeminate," and their dancing "sexually provocative". They minced and gyrated their hips in slow vertical and horizontal figure-eights. These dancers were so popular that competition for their sexual favors among the male audience caused fights, which resulted in such performances being banned in 1856. Eventually the ban was lifted, but with the suppression of harem culture under the following two Sultans, köçek dance lost the support of its royal patrons, and gradually disappeared. The current trend for male belly dancers started in the '60s in the United States. Well-known male dancers from the 1970s onward include Ibrahim Farrah and Adam Basma from Lebanon, Bert Balladine, John Compton, Sergio, Horacio Cifuentes, Kasim of Boston, Amir of Boston, Aziz, Kamaal, Amir Thaleb, Prince Andrew, Saleem, Mark Balahadia, Zorba, Francisco Carranza (Mr. Bellydance U.S. 1989), Valizan from Canada, Viraj, Nath Keo, Jim Boz, DaVid, Tito Seif from Egypt, Jamil from Sydney, Jamil El Saffy from Melbourne and Tarik Sultan of New York. Asi Haskal is very famous from the Middle East. Male belly dance is having a resurgence. There is heated debate on such issues as whether there should be differences in costuming, attitude, and choreography between male and female belly dancing. Belly dance is a non-impact, weight-bearing exercise and is thus suitable for all ages, and is a good exercise for the prevention of osteoporosis in older people. Many of the moves involve isolations, which improves flexibility of the torso. Dancing with the veil can help build strength in the upper-body, arm and shoulders. Playing the zills trains fingers to work independently and builds strength. The legs and long muscles of the back are strengthened by hip movements. Paffrath also researched the effect of belly dance on women with menstruation problems. The subjects reported a more positive approach toward their menstruation, sexuality, and bodies. Belly dancing has recently been made popular by Latin American superstar Shakira. Although she is Colombian, her part-Lebanese background has influenced her style. The Brazilian novella O Clone also known as El Clon in Spanish-speaking countries and the United States, is set in Brazil and Morocco and featured belly dancing in many episodes. The lead character, Jade (Giovanna Antonelli), used it to entice her lover Lucas (Murilo Benício), and to soothe and seduce her husband Said (Dalton Vigh). Several James Bond films have also featured belly dancers. In The Man With the Golden Gun, the belly dancer Saida wears a spent bullet in her navel, which Bond accidentally swallows while trying to retrieve it. R&B singer Aaliyah used the belly roll as her signature move. Other singers who have performed belly dance moves include Britney Spears, Christina Aguilera, Jessica Simpson, Beyonce, Ciara, and Hilary Duff. Probably the most famous belly dance troupe is the group formed by Miles Copeland with input from Suhaila Salimpour, Bellydance Superstars tours internationally, furthering the popularity of belly dance around the world by performing over 600 shows in over 20 countries. The shows have made stars of several of its dancers, including Rachel Brice. Documentaries about belly dance include: American Bellydancer, Belly, and Temptation of Bellydance.